I have an array of emotions. I’m disappointed yet excited. It all has to do with what happened this week and what is going to happen this weekend. I’ll explain through six timely topics that is known as this week’s Doyle’s Half Dozen. Donald Trump demonstrated this week why I cannot vote for him as U.S. President. I believe the most important issue for Christian voters is the sanctity of life. How a candidate views this issue affects practically every other important issue. This issue, I believe, reflects how they view God the Creator. And this issue ties closely with how a candidate views religious liberty and the importance of natural/traditional/biblical marriage. But first, for a political candidate to get my vote, they have to value life, all life and all stages of life – from the womb to the tomb. Trump has said that he is pro-life, and that’s the right “code term” to appease social conservatives, but then he gives glowing remarks on Planned Parenthood, the world’s largest abortion provider, on how they help so many women. This makes as much sense as a person who says they are for strict smoking laws but commends the Tobacco Industry for doing charitable causes, all the while their products continue to cause cancer. This week, Trump revealed even more that he doesn’t get it. In his interview with Chris Matthews, he said the mother should be punished for aborting her child. Every time I watch a replay of this, I automatically do the face palm. I can elaborate on why his answer, even though he has since retracted his remark, is so foolish, backward and a strong revealer why he isn’t sincerely pro-life, but there have been some great commentary already released. Brian Hobbs’ post “Condemnation or Compassion” is a good starting point. He explains why Trump comments tainted pro-life causes. Finally, check out Denny Burk’s blog “Why ‘punish’ abortionists but not those who receive abortions.” This is lengthy, but Burk does a great job of setting the record straight on the pro-life philosophy. To support what he said about crisis pregnancy centers, check out my article on Carolyn Anson, “Set Free to Serve.” I’m a big fan of this woman. I don’t know anybody who has a greater passion for women than Carolyn, and I feel privileged to be able to write about her journey that led to her being the new director of the Hope Pregnancy Center North in Oklahoma City. A few weeks ago in my March 4 DHD, I mentioned my campaign to “Leave it blank,” referring to the possibility that if there is not a presidential candidate who genuinely represents the pro-life movement, I would leave my ballot blank on that specific election. Someone asked me this week if that would be counted. I rationally concluded that it would count because voters leave different election options blank all the time, as far as not knowing anything about district judges or state questions, etc. But to verify my conclusion, I spoke with Bryan Dean, the public information officer for the Oklahoma State Election Board. He said yes, leaving it blank, is counted. It is declared an under vote, which can be construed as a voter’s dissatisfaction with all of the possible candidates. Dean also said that the possibility of the number of presidential candidates being only two would be incorrect. Oklahoma will now recognize the Libertarian Party, and it is likely there will be other candidates on the ballot who will be classified as independent. My prayer is for a legitimate pro-life presidential candidate who can receive my vote. If not, my blank vote will be counted. I asked a co-worker on Thursday what her plans were this weekend. She told me she’s going to be in Tulsa this weekend and that she is planning to go to the State Training for Oklahoma Baptist Disaster Relief (DR) volunteers. I was rather impressed with her choice. If you are not familiar with DR ministry, it is one of the most visibly impactful works done by Southern Baptists, and Oklahoma DR volunteers are the best of the bunch. To learn more, visit http://www.bgco.org/ministries/disaster-relief/ and find out about other training opportunities. God’s Not Dead 2 opens this weekend. The original movie did fairly well at the box office, and the sequel appears to be quite timely. Check out Karen Kinnaird’s movie review and consider see God’s Not Dead 2 this weekend. The Final Four is this weekend! The Oklahoma Sooners men’s basketball team will face Villanova on Saturday at 5 p.m. on TBS, and I couldn’t be more proud of what this squad has accomplished. I’m pulling for Lon Kruger because I think the man deserves a national title, especially with all he has done with so many different programs. There couldn’t be a nicer man on the planet, and I’m thrilled he’s coaching the Sooners. 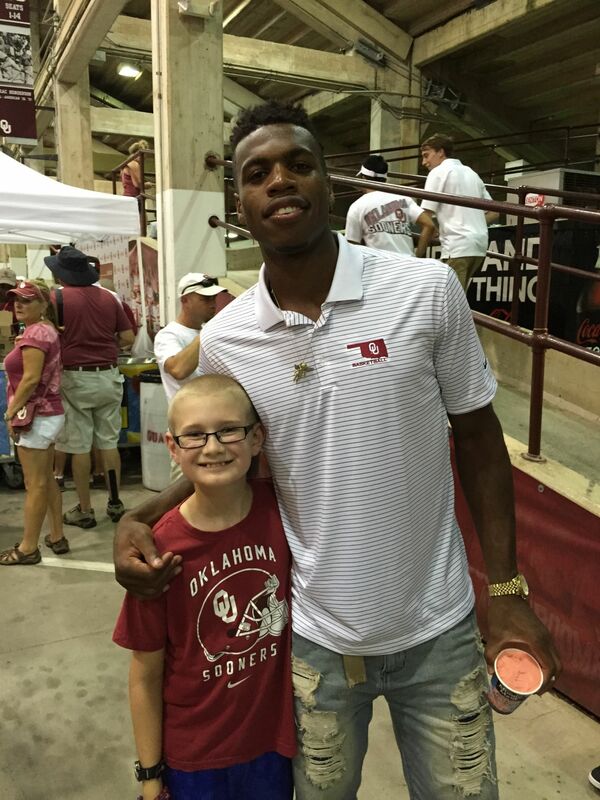 I’m also happy for Buddy Hield. I’m on the Buddy fan wagon with everybody else. But I have to share an extra reason why. Back during football season, my brother Jon and nephew Will joined my wife Karen and me at the Sooners season-opener. While Jon and Will were down in the concession area they ran into Buddy and asked him if he would take a picture with Will. Of course, being the gracious guy that Buddy is, he willingly posed with my young nephew. Jon sent me a file of the photo, and I got an 8×10 print made. Through Mike Houck in the OU athletic media relations office, I was able to get Buddy to sign the photo print, got it framed and gave it to Will as a Christmas present. Watching Will’s eyes light up when he opened his present was worth all the effort. Go OU, go Coach Kruger and go Buddy!